Many homeowners are surprised to find out that their home is susceptible to earthquake damage, and earthquake zones are spread throughout the Midwest and eastern portion of the United States. There are steps you can take to reduce the likelihood that your home and personal property are damaged by an earthquake. Bookcases and cabinets should be anchored properly to walls, and latches should be installed on drawers, cabinet doors and cupboards to prevent inside contents from falling out. Install shelves with ledge barriers to keep valuables from sliding off during small tremors, and keep heavy objects on lower shelves. Attach heavy desktop items like computers and small appliances to the surfaces of the desks, tables or countertops. Ceiling fans, lights and plant holders should be secured to ceiling joists or beams, rather than only to the plaster or drywall of the ceiling. If any of your furniture or large appliances have rollers, place locks or holders on the rollers to prevent damage. Gas appliances should have automatic shut-off devices if there is a possibility of the appliances pulling away from walls or connections. If properly structured and anchored, your home will absorb an earthquake’s energy and transfer that energy to the ground. 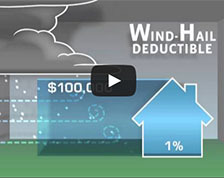 Have your home inspected to be sure the roof is properly constructed and attached to the walls. The walls must also be properly fastened to each other and braced and anchored to a strong foundation. If your home needs to be reinforced, anchor bolts or steel plates can be used. Unreinforced masonry and concrete walls, foundations and chimneys can also be braced. Consult a professional for a proper inspection and plan for reinforcement. There are no warnings for earthquakes, but it is important to learn the best ways to protect yourself and your family during an earthquake strike. The phrase, “Duck, cover and hold,” is often used during earthquake training. Discuss this with your family and advise them to drop to the floor, take cover under a desk or table and hold on to it during an earthquake. Review an escape plan from your home with your family and discuss the safe place in your neighborhood or community that will serve as a meeting place if a disaster strikes. Teach your family the locations of the main shut-offs in your home for gas, water and electric, as leaks and disconnections can cause both injury and damage. 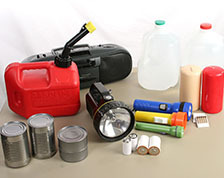 Prepare your family emergency kit and make all family members aware of its location. Instruct your family of the best place inside your home to take cover in case of an earthquake, and also what to do if they are outdoors when an earthquake strikes – move into the open, away from trees, buildings and overhead wires. If in a vehicle, pull over to the side of the road but away from power lines, road signs or bridges, and wait for the earthquake to stop.